Whooping cranes have taken up residence in South Carolina, at least for part of the year. That's a big deal. They're one of North America's rarest birds and haven't been in the Carolinas in probably a hundred years. I almost got involved with Whooping Cranes a long time ago, and I wish I had. When I finished college, I wrote off to somebody (I forgot his name, Ray? Roy?) who was managing a Whooping Crane recovery project in another state. He and his cohorts were using Sandhill Cranes to raise Whooping Crane eggs. The researchers had found that if they removed eggs from Whooper nests and slipped the eggs into the nests of Sandhill Crane foster parents, the Whoopers would simply lay replacement eggs. Thereby doubling the production of Whooper chicks per year at this recovery facility. The researchers used gloves fashioned to look like crane heads when they tended the babies, so the cranes wouldn't lose their fear of humans. I wanted to work for this project helping an endangered species. But as fate would have it, Ray or Roy or whoever had no money to hire anyone else, was making use of volunteer labor, and I decided to do something else. That's the proverbial road I did not take, as Robert Frost wrote of in his famous poem The Road Not Taken. That decision was probably a big mistake on my part, given the situation I find myself in at present. But I digress. To cut to the chase....I've always been interested in Whooping Cranes. They're making a significant comeback, and the story is pretty intriguing. Way before people fouled up almost everything outdoors, the range of Whooping Cranes extended from the Arctic coast into Mexico, and from Utah to NJ. Their range included wintering grounds in the Carolinas, Georgia, and Florida. Then, because of hunting and habitat destruction, their numbers dropped to only 16 birds in 1941, all in one little flock that nested in Canada and overwintered in Texas. But by the 1970's and 80's, recovery efforts were well underway. Those efforts included raising Whooping Cranes in captivity as I mentioned above. Sandhill Cranes played a big part, standing in as surrogate parents and even surrogate flocks. In 1998, scientist Kent Clegg figured a way to teach some captive-raised Whooping Cranes how to migrate from Idaho to New Mexico. He trained them to follow an ultralight plane, and when they got to New Mexico, he got them to mingle with a robust Sandhill Crane flock, so they wouldn't be alone and would learn flocking behaviors. Due to these and other recovery efforts, the western flock of Whooping Cranes has now expanded to about 270 birds, according the USFW Service. A big increase! Recent events in the East have caught my attention, and motivated me to write this post. 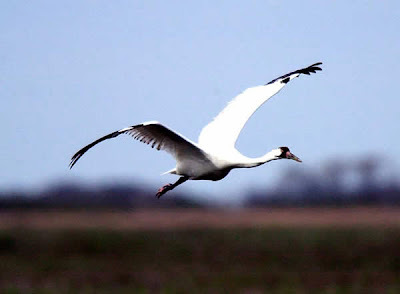 In 2001, the USFW Service began trying to reintroduce Whooping Cranes to the eastern part of the country, which has had no birds at all for a century or more. The Whoopers have been taught with another ultralight plane to fly from breeding grounds in Wisconsin to overwintering grounds in Florida, and back. It's amazing that the plane gimmick works - just like in the fictitious movie, Fly Away Home (about geese following an ultralight plane). But cranes are programmed genetically to follow something flying (normally their parents) to learn the ancestral migratory route. Somehow a slow quiet small plane will suffice. As I mentioned, Whooping Cranes used to overwinter in the Carolinas as well as Florida. But the newly expanded population has never been trained to come here. However.....in early 2004, one group flying up from Florida, en route to Wisconsin, hit some strong winds that blew them east and they settled down near New Bern, on the coastal plain of NC. My home state. Two males of the original seven that put down here in 2004, along with their mates, continue to return to the ACE basin in South Carolina. The individuals are known as 10-03, I, and WI-06. Don't know the fourth one. I, for one, am delighted to have them here. The total Eastern migratory population is only 73 Whooping Cranes, including the ones that go to Florida. That's a lot, especially when you consider we now have 343 in the whole country. Compared to the 16 we once had. The Carolina coast is wild in places. I went with a USFW biologist once to see some red wolves, who roam freely on the NC coast, in the Alligator River Nature Preserve. Turned out the only wolves we found were some that were in a pen awaiting inoculations from the USFW staff. But over 100 now run free throughout the preserve, so I guess cranes can live here too. Frost begins his poem with "Two roads diverged in a yellow wood". Although I have regrets about the road I didn't take, as an aspiring biologist years ago, I'm thrilled that a few cranes turned left one year, and now seem to prefer South Carolina to Florida. Maybe, if we're lucky, they'll thrive here. Jack Horan. Whooping Cranes: four of the rare birds, once almost extinct, have made a home on the Carolina coast. Charlotte Observer, January 25, 2009. We’ve been wanting to buy a more fuel-efficient car for some time, but, given our financial insecurities, we’ve been putting it off. Finally, we were forced into action when our 14-year-old Volvo was totaled in a December accident. The question was thrust upon us: what to buy as a replacement? Reluctantly, we ruled out a Prius. We'd love to be really really green, but we just can’t or won't commit to the expense of a brand new car. Luckily, plenty of other cars beat out the old Volvo on both gas mileage and emissions ratings. That's what we learned from www.greenercars.org, which offers ACEEE’s Green Book. The Green Book and the website have a list of the “Greenest Vehicles of 2008.” The cars are rated by emissions as well as by gas mileage – very helpful. The top 12 cars on this list include four hybrids and several very small cars such as the Mini Cooper, the Honda Fit, the Smart ForTwo, and Toyota Yaris, which are too small for us. We found ourselves homing in on two from the list: the Honda Civic and Toyota Corolla. The www.greenercars.org website offers ratings of older cars too, but you have to pay for that. Hmmm.....we definitely had to have a used car. Then we spotted on www.cars.com a page that lists the top 25 cars from 2004-2008, rated in terms of gas mileage. Numbers 1 and 2 were the Prius and the Honda Civic Hybrid, but 3 and 4 were the Honda Civic and Toyota Corolla. Yay. That cemented our search for those two in particular. This site gives the mileage for the Civic as 34-39 highway; for the Corolla 34-37 highway. A couple of other websites, www.fueleconomy.gov and www.safercar.gov were helpful in theory, although we didn't actually use them very much. The three websites above are incredibly helpful if you’re looking for a used car. Each has a search engine that allows you to enter your zip code, how far you’re willing to travel, the mileage you want, the model by year, the model by manufacturer, the price range, etc. For example, we could look for a 2005 Honda Civic within 30 miles, with no more than 50,000 miles, for $10,000 or less, available from a private party. Which is what we did – eventually. Before that, we spent a lot of time diddling around, looking at used cars from dealers. That turned out to be a waste of time because their used cars all had some history of being used as a rental car, or some minor accident, or multiple owners, or something that was a red flag. None of the dealers would come down to a price that we were willing to pay. We learned that checking the VIN (vehicle identification number) on a used car is essential – you have to pay for an online service like Autocheck or Carfax to get a specified time period of unlimited checks. Then when you type in a car’s VIN number, you get a report on any and all accidents the car has been in, plus how many owners it’s had, whether it has been sold at auction, or has failed emissions tests during inspections, etc. That saved us from buying a beautiful 2006 Honda Civic that we were swooning over – but it had been totaled and restored, we learned from AutoCheck. What’s worse, we would not have been able to get any collision insurance at all on that car, because it had been totaled and restored, or “salvaged.” A “salvage title” is, for our insurance company at least, uninsurable. Sadly, we resumed our search, looking a little farther out of town. We went to see a 2005 Honda Civic 30 miles away, for sale by a private owner. 40,000 miles. One owner. Driven only to take the kids to school and back. No scratches. New tires. We had it checked out by a mechanic in that town, and he said it had no problems. The most useful of these three websites, in Charlotte anyway, is Kelly Blue Book. The owner had already checked, and his asking price matched almost exactly the KBB value for a private-party sale of a 2005 Honda Civic in “Good condition.” Since the car was in excellent condition, we didn’t have much leverage, but the seller did come down $200 after I complained that it had no side airbags. To finish the deal, we had to get a cashier’s check, go to a notary with the seller to transfer the title, go to the DMV to get a new plate, and we were set. We had our little Honda. We call her Smacky, and she seems brand new. We’re thrilled. We expect her to last another 150,000 miles. Hey, even our 1996 Nissan van has made it to 149,000. And the Honda is a much better car. We're testing the gas mileage now on the Honda, but it's been almost a month and we still haven't had to refill the tank! Yay! I'm glad we took the time to find what we wanted. But what's the deal with those composite logs that come wrapped in paper? Are they okay, or are they full of toxic chemicals? Actually, artificial fire logs are a pretty good thing, environmentally. They burn much cleaner than real firewood. Typically, they produce 70% less particulate matter, 85% less carbon monoxide, and 50% less smoke than real wood. In the past, fake logs were usually made from sawdust and petroleum wax. The wax produced most of the heat - the sawdust served the same purpose as a wick in a candle. But now, fake fire logs are likely to be made from natural vegetable waxes instead of petroleum wax. Vegetable waxes are extracted from plants that were recently alive and so were removing CO2 from the atmosphere during photosynthesis - as all living plants do. That compensates for any CO2 released during their burning, and makes them greenhouse-gas-neutral or "carbon neutral." So, in other words, burning fake logs made from vegetable waxes has no overall impact on climate change. 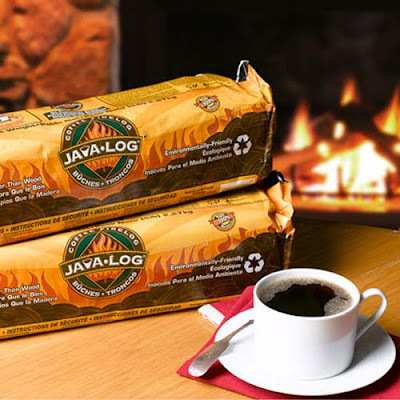 There's another new type of firelog, the Java-Log, made from recycled coffee grounds. These logs smell like coffee, produce 25% more heat than firelogs made with sawdust, and produce more brilliant flames. One more benefit of fake logs over real logs - most fake fire logs produce less creosote to accumulate in the chimney than real logs do. But some fake fire logs are simply 100% compressed sawdust. They have the same effect on the atmosphere and the chimney as a real log. So if you have a choice, choose the fake logs made from vegetable waxes and sawdust, or the Java-Logs. They burn the cleanest and have minimal impact on our air and our climate. Source: James Dulley. 1/3/09. Charlotte Observer. "Artificial firelogs green, hassle-free." My family visited the Peruvian Andes this past summer. We loved trekking and birding in the most biodiverse country on the planet, but more than that, we loved the people of Peru. 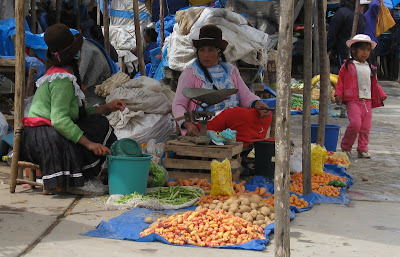 In the Andes, the majority of people we met were indigenous Quechuas. Their first language is Quechua; the women still wear distinctive traditional clothing, including the well-known fedora hats and colorful handmade garments. Some of the Quechua people we met were employed outside of their communities - as taxi drivers, or cooks at tourist lodges. But most still live the farming life; they are, in Spanish, "campesinos" or "country dwellers." While we were in the Cordillera Blanca near the trekking mecca of Huaraz, Peru, we stayed at Llanganuco Lodge. We got to know the lodge owner Charlie Good, a transplanted British economist. He is the only Westerner in his community - his neighbors are all Quechua families who live and farm their ancestral lands. As an environmentalist and a socially-attuned resident of his community, Charlie is concerned about his neighbors' future. Apparently, the Peruvian government wants to privatize the water supply and charge Quechua farming communities in the Andes for using water from the irrigation canals that their own ancestors dug hundreds of years ago. That's a serious problem for families living on the edge of subsistence. Another accelerating problem is the influence of TV and modern technology in rural communities. With new Western aspirations, Quechua teenagers are moving to nearby towns. Their departure leads to "under-usage" of the land. Under Peruvian law, underused farm land can be reposessed by the government. So Quechua families are in danger of losing the farms that have been held by their families for a very long time. 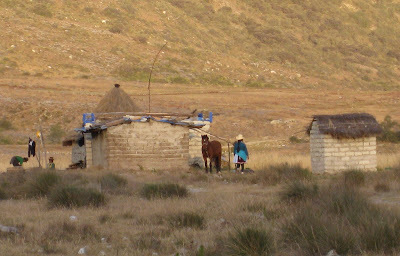 For visitors to Huaraz, the life of the Quechua Campesino may seem an idyllic one, and sure their balanced and sustainable life is enviable. Especially as they have their own plots of land, live with their families, are surrounded by their friends, and can produce all that they need. Indeed we could do with taking a leaf out of their book in modern “society”. However the poor Andean communities of Peru are facing a crux move. Challenges are mounting from many angles. The seemingly benign and beneficial arrival of electricity, bringing TV and all its woes, the free trade agreement with the USA, rising seed and fertilizer costs, and the government’s water privatisation plans will end their way of life. Privatisation is a good idea I hear you say, well maybe… considering the problems this country faces with hastily retreating glaciers, but to use bureaucrats to charge the campesinos for the water they use for irrigation from the very irrigation ditches they themselves constructed….to me is highly questionable – firstly cost vs benefit issues are obvious and secondly does “Ancestral rights” not ring any alarm bells? Ancestral rights – being the very reason for the land reform act in 1968 that handed back ownership to the people of this land, which brings us to another cute one, the government legalising the sale of community land, perhaps a rumour, but a dangerous one if true. These factors and more amount to huge pressures to leave the communities. So with dwindling populations and under-usage of the communities’ lands, what happens? The government instigates old laws to seize these lands, due to under-usage, which they will now be able to sell. This all sounds like scaremongering? I just hope you are right because maintaining the knowledge of self-sustainable societies may well be essential for our survival. In the meantime I'll be living in one of these communities promoting sustainable development and tourism, and trying to give these youngsters a reason to stay - that's my main challenge. You want to help? Great! Charlie Good is an economist from Bristol Uni, UK. He is a full-time Peruvian resident and owner of Llanganuco Lodge. Forty percent of fish species in North American streams, rivers, and lakes are now in trouble. That's according to a detailed new evaluation of their conservation status by scientists from Canada, Mexico, and the U.S. Geological Survey. The report was just published by the American Fisheries Society in the journal Fisheries. The 700 fishes now listed as imperiled represent a whopping 92% increase over the 364 listed in the previous report 20 years ago. Of those 700 imperiled fishes, 280 were listed as endangered, 190 as threatened, and 230 as vulnerable. Said Mark Myers, director of the USGS, "Freshwater fish have continued to decline since the late 1970s, with the primary causes being habitat loss, dwindling range, and introduction of non-native species. In addition, climate change may further affect these fish." 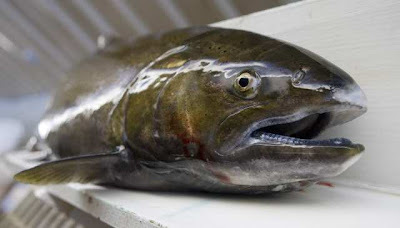 Unfortunately for American consumers, the fish most at risk include many that are popular with sportsmen and commercial fisheries, such as salmon and trout of the Pacific Coast and western mountain regions. More than 60% of the salmon and trout species surveyed had at least one population or subspecies in trouble. Twenty-two percent of sunfishes (a family that includes popular black bass, bluegill, and rock bass) were listed. Areas with especially high numbers of imperiled fish include the Southeast, the mid-Pacific coast, the lower Rio Grande, and basins in Mexico that do not drain to the sea. This is the third list compiled by the American Fisheries Society's Endangered Species Committee. Of the fish on the 1989 imperiled list, only 11% have improved in conservation status. The remaining 89% are more at risk or have stayed the same. "Fish are not the only aquatic organisms undergoing precipitous declines," said USGS researcher Noel Burkhead, chair of the AFS Endangered Species Committee and a lead author on the report. "Freshwater crayfishes, snails and mussels are exhibiting similar or even greater levels of decline and extinction." What about that seafood dinner you have planned?? If you plan to continue eating fish, check out the Seafood Selector on the website of the Environmental Defense Fund, at http://www.edf.org/page.cfm?tagID=1521&redirect=seafood. See their "Eco-Best", "Eco-OK" and "Eco-Worst" lists of seafood, easy to understand at a glance. The webpage has lots of other information about eating fish, including fish recipes, fish substitutions, and information about pollutants such as mercury. Our 2008 book Going Green has a section on fish called "Seafood - Here's the Catch." In this section we describe destructive mass-fishing techniques such as blast fishing, longlines, and gill nets. Sadie reports on a couple of disturbing interviews with fisheries professionals, who report that workers pee into the fish-stick vat, drop boots into the mix, etc. We were surprised too at what we learned while researching farmed fish. Most of the fungicides, dyes, antibiotics, and pesticides dumped into the cages of farmed oceanic fish actually wind up outside the cages, where they impact wild communities. And then there are the genetically modified fish..that's another distressing story. The consumption of fish is not as simple as it once was! For a thorough review of these issues, check out The End of the Line: How Overfishing is Changing the World and What We Eat by Charles Clover, or The Empty Ocean by Richard Ellis. Jim Wilson. December 2008. Number of Imperiled North American Fish Up 92 Percent.